CHARLOTTE, N.C.— Trevor Lawrence spent the season finding a rhythm after being named the Tigers starter in week five. 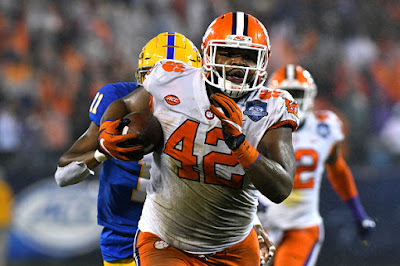 Although, the freshman quarterback didn’t need to much for Clemson in a 42-10 rout of Pitt to take home a fourth consecutive Atlantic Coast Conference Championship on Saturday night. Travis Etienne hit the ground running to finish with 156 yards and two touchdowns. The ACC Player of the Year took the first play from scrimmage 75-yards to the house, giving No. 2 Clemson (13-0) a 7-0 lead 13 seconds into the game. "All of that credit goes to the offensive line because they come in and grind every day of the week," Etienne said. It was the longest scoring play in ACC title game history and gave Etienne his 20th touchdown of the season. Pitt (7-6) scrapped together a little bit of offense after falling down by two early scores. Qadree Ollison’s one-yard touchdown run with 7:56 to go before halftime made Clemson lead 14-10. The Tigers responded with two touchdowns passes from Lawrence to Tee Higgins before heading into the locker room, giving Clemson a 28-10 halftime lead. The Tigers ran for 301 yards and four touchdowns on a dreary, rainy night at Bank of America Stadium. Keeping up the pace for Lawrence’s season-low 118 passing yards. Clemson’s defense forced three turnovers and held Kenny Pickett to 4-of-16 for 8 yards passing. As a whole, the Tigers racked up nine tackles for loss, including two sacks of Pickett and an interception. Pitt’s offense struggled to find consistency down the stretch with a total of 11 first downs to go along with 3-17 on third down conversions. The Tigers have won 56 of their last 60 games under coach Dabo Swinney, who celebrated his tenth anniversary with the school with the win. The 101-22 record in the past eight years represents the winningest decade in Clemson history. Pitt coach Pat Narduzzi has faced Clemson and Notre Dame this season and said there is "no comparison" between the two. "Clemson is the best football team we have faced this season and they will probably win a national championship in my opinion," Narduzzi said. "That's a good football team from the front end to the back end." Clemson waits for the College Football Playoff rankings which comes out on Sunday. The only guarantee is Alabama (13-0) will be No. 1 follow by the Tigers (13-0) at No. 2. Notre Dame (12-0) is still at No. 3, and the last spot is up for grabs between Big 12 Champion Oklahoma (12-1) and Big Ten Champion Ohio State (11-1). Swinney believes if Clemson faces Alabama for a fourth straight year in the playoff to consider it a rivalry. "I think four would make it a rivalry," Swinney said, whose team is 1-2 against the Crimson Tide the last three years. "And we need to beat them more, too. It ain't much of a rivalry when you are losing, so we got to win more."